Seal Reed Tucker doesn't believe in commitment, until he tangles the sheets with one hot pilot, Delaney O'Connell. His phobia against commitment is challenged when his best friend asks Delaney to marry him first. As a helicopter pilot for the 160th Night Stalkers, Delaney knows the risks of loving a SEAL. When her lover's friend loses an arm in battle, she can't refuse his marriage proposal when he's already lost so much. In love with one man, pledged to marry another, she's torn. Short but sweet. I liked the fake out at the end & that the story didn't wrap up all their problems with a bow. Romances often smooth out all issues in the last two pages & I respect that the author didn't do that here. Elle James has written an outstanding military romance. Her characters are embroiled in gut wrenching action and suspense and still have opportunities to fall in love. Gotta love it! I enjoyed this audiobook very much. The characters of Tuck and Delaney were such a firey match. Highly recommend this book. Talk about an awesome story. Love love loved it! I can't wait to continue on in this series! The setting and story were fairly interesting. I love romance, but the battle scenes and descriptions of the gear, tactics, and situations in Afganistan were probably the most interesting. You can only read so many romance novels set in a big city office, or a small town. This was refreshing in that way. It was just too short, a little more character development would have done wonders for this story. It seemed like the main characters met and hung out a few times and suddenly were in love. There was just not enough time to let anything real develop. The ending was predictable yet surprising at the same time. If I could I'd give it 3.5 stars, but since I can't 3 stars! 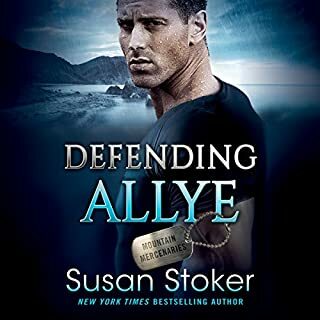 This was a good military romance to take your mind off things. It was fast paced & kept me interested. The narrator did justice to the book. 4.5. In love with Tuck❤ Love strong Delaney and really felt the bond with the team. I was right there in the thick of things. Great plot.